From London to California, Shakespeare’s Richard III is all over the place. Mark Rylance, former artistic director of The Globe Theatre and one of today’s best Shakespearean actors, has returned to the London stage in the lead role to rave reviews. In Temecula, California, Shakespeare in the Vines is staging the play through August 25 at the Callaway Vineyards and Winery, a venue where there should be wine enough to fill the barrel into which Richard III’s murdered brother is stuffed. 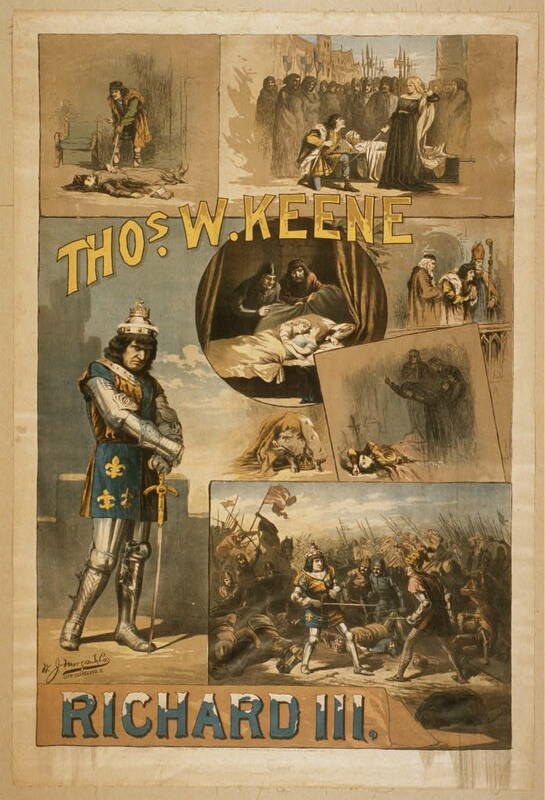 Born in New York City, the tragedian Thomas W. Keene, the stage name of Thomas R. Eagleson (1840-1898), played Richard III for audiences in Cincinnati and Boston during the years following the American Civil War. The panel in the upper right illustrates the play’s seduction scene in which Richard woos Lady Anne, the wife of the man he’s just murdered. The first play to be published under Shakespeare’s name (in 1598 – up until then his plays were published anonymously), Richard III has been staged thousands of times. Listverse ranks it number 6 on the list of the Top 10 Greatest Shakespeare Plays. In Baltimore, the Chesapeake Shakespeare Company will showcase the play October 5-28. Just down the road in Washington, DC, Brave Spirits Theatre recently finished a highly successful run of Richard III (full disclosure: I’m a Brave Spirits supporter). Directed by Charlene V. Smith, the Brave Spirits no-frills production featured standout performances by Victoria Reinsel, Travis Blumer, and Jessica Lefkow, joined by seven other actors taking on 48 roles. Smith’s creative direction put comic relief into the scene of the murder of Richard III’s brother. For the ghost scene, Smith organized the spirits into a choir and, in an effective reordering of their speeches, had them take turns haunting the villainous king before encouraging the Earl of Richmond, the play’s hero, to dream of victory. Now, here are three quick reasons to see Richard III. A relevant story. To gain and retain power, a man slaughters his own countrymen and even children while plunging his nation into civil war. Sound familiar? It’s the story of Richard III and the story of today and, it seems, of every day, one reason audiences still connect with this play. It reminds us that no matter what century, ruthless, dictatorial leaders can make people suffer through the scourge of sectarian violence. History lessons. Richard III offers not one but several history lessons. First, it’s a condensed version of the last seven years of the 30-year War of the Roses, a civil war in which two royal houses – York and Lancaster, the respective symbols of which were the white rose and red rose – duke it out for control of England. Historically, the play is also an early example of state propaganda. In the play, Henry Tudor, the Earl of Richmond, slays Richard III, ending the War of the Roses and restoring peace and order to the realm. The earl, later crowned Henry VII, was the grandfather of Elizabeth Tudor, who became Queen Elizabeth I and occupied the throne when Shakespeare’s play premiered. As with all Shakespeare’s plays, Richard III opens a fascinating window into the history of our language and culture. It shows us, for example, how Elizabethans believed that a person’s natural physical appearance revealed his true nature. They also believed that toads were venomous and evil. In their eyes, Richard III, “rudely stamped” as a “poisonous bunchdback’d (hunchbacked) toad,” would be as evil as evil gets. Showing the nature of evil. To modern eyes Richard III may not look particularly evil, but his actions prove him so – at least in comparison to the historical Richard III. By watching Shakespeare’s Richard III, you can learn a thing or two about evil men, for example how they can share the same flaws as good men, such as an overconfidence that leads to Richard III’s downfall. At its worse, evil is self-aware: Richard III is consciously bent (so to speak) on being a villain, using fear as his best tool. At the same time, evil can be charming. In one early scene, the demented protagonist manages to successfully woo Lady Anne whose husband he’s just murdered, in front of the dead man’s body no less! Richard III’s incredible seduction scene is a challenge for actors to make believable, and another reason to see this hugely popular play.